We've asked our readers to share their ideas on how we can re-start Romania. Or better said, on how can Romania be re-started. Not all the measures are in the hands of the people, but rather in the hands of our country rulers. But we've got some good ideas from some our expat readers, see them below. We thank them all for sharing their thoughts at a time when most people only care for their own turf. 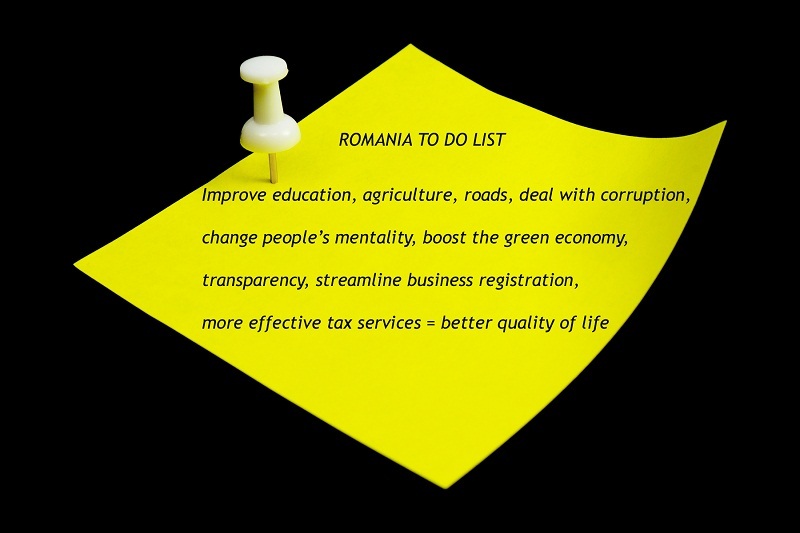 Corrie van der Westhuizen has a list of ten things that should be done in Romania. Stamping out corruption and changing people's mentality are first on his list, and these the Romanian people can work on. Two other readers, John Mulligan and Piero Sraffa also agree on dealing with corruption as one of the main measures. “Unless Romania deals with the corruption that permeates all levels of society, all other initiatives are a waste of time — a building built on sand. Until decisions are made for the common good, the citizens of Romania are not being represented by the so-called democracy that replaced the Ceausescu regime. Root out corruption, and everything else will follow (including even human rights, a concept sadly lacking within Romania’s local and national government),” says John Mulligan. “Romania will not join the EUR-zone before the most important problem is under control. This is the fact !” according to Piero Sraffa. Agriculture should also be a focus, Corrie van der Westhuizen thinks. This is an idea supported by another reader, Andrew, who thinks agriculture is the key to Romania's future. Education was the thing mentioned by two other readers, Leslie Hawke and Ela Robinson. “Early education is key!!! When children start school behind, they stay behind. Children who get a good start are less likely to need “special education” and are more likely to graduate. When those children become adults, they are more likely to hold jobs and earn higher salaries, less likely to commit crimes, less likely to be on welfare. The international research is clear that the money spent on quality early education saves taxpayers significant expense in future costs. And that serves everyone well!” says Leslie Hawke, who runs the Ovidiu Rom charity in Romania. Ela Robinson, the head of school at the International School for Primary Education, thinks a country is only as good as its education system. “Children should not sleep at school. School is for learning. Teachers should teach for a whole day and the academic year should be longer. The formal style of teaching should be changed and emphasis should not just be limited to knowledge but to skills, concepts and attitudes. We all should be educating for global citizenship. This won’t make a change tomorrow but the government should plan for the future. Children are our biggest investment,” she says. The focus on education should certainly be among key priorities in the country, especially given the recent results at the high school final exam: only 67.4 percent of the students passed the test, which is the lowest result in the last eight years. In Bucharest, the rate was even lower – 58.9 percent. “For rebooting the economy and helping immediately, a green economic stimulus is required. Energy efficiency measures and renovation of existing buildings creates high, medium and low skill jobs for people and a lasting dividend in energy cost savings and security,” he says. Massive government spending on free solar panels and 80% subsidies for polystyrene pasted onto buildings are NOT the solution…. smaller incentives, more financing options, tax reductions for thoughtful green projects will spread the benefit widely and unleash economic opportunity for a sector that is a substantial part of the economy, says Steven Borncamp. “Corruption is the scourge of many poor quality construction projects in Romania and elsewhere that needs to be contained before people get the jobs, homes, schools, workplaces, parks, etc. they deserve,” he adds. John Korst talks about the need for transparency on all segments and about the required dedication of the politicians to their their jobs above loyalty to party hacks or their own interests. Korst has set up the foundation "A Thousand Books" and has donated English books to schools across Romania. “The education system is in a mess because politicians only worry about control rather than the children,” he says. The road contract costs would be in line with the rest of Europe. Corruption of all sorts would be more under control, he adds. Streamlining registration of new businesses and promoting entrepreneurship, together with more effective tax services should also be considered, readers have pointed out. In the end, it boils down to the quality of life: for inhabitants, for foreign investors. “As a final, and even more important note, the petty bureaucracies in all level of society make life very frustrating. No one talks about doing business or living easily there,” says John Korst.